Go to Management and go to Projects. Click the blue 'edit' button at the Project 'Correspondence Networks' to edit the Project you created earlier. Click on the tab 'Organise'. For each Type and Classification enabled in this Project you see a tab. By clicking on a tab you see a number of settings that can be configured per Type and Classification. Click on one tab and locate the 'Colour' input field. Click on this input field to select a colour or enter a colour code in a six-digit hexadecimal notation (e.g. #a3ce6c). The specified colour will be used throughout this project to colour occurrences of Objects or Categories (i.e. 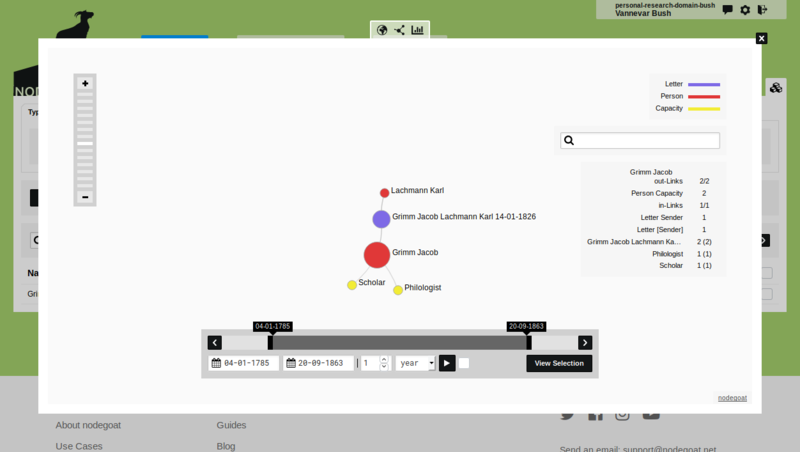 the nodes in the Social Network Visualisation, or tagged Objects/Categories in texts). This colour overrides the colour set in the data Model.